Authorized by the General Assembly in 2005, Carvers Creek State Park in Cumberland County is an example of a state park combining both historical and natural heritage. The park was authorized under the General Assembly’s 2005 New Parks for a New Century Initiative. Interim facilities were developed with $756,000 from the North Carolina Parks and Recreation Trust Fund. The park opened to the public in September 2013. With the help of The Nature Conservancy, the first major acquisition for the state park was 1,371 acres of longleaf pine forest near U.S. 401 north of Fayetteville. This longleaf pine ecosystem is an important habitat for several endangered and protected plant and animal species, most notably the red-cockaded woodpecker. Additional acres in the Sandhills adjacent to Fort Bragg were aquired. Much of the land in the Sandhills nature tract is ecologically fragile and will be left undisturbed. The second tract was added in the summer of 2010 with the donation of the 1,420-acre Long Valley Farm from The Nature Conservancy. This historic farm, built in 1939, was once the estate of James Stillman Rockefeller who built it circa 1937 for his family. Rockefeller gifted it to The Nature Conservancy in his will when he died in 2004. 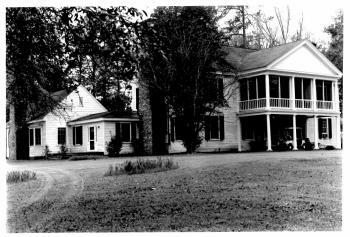 The historic farmhouse remains on the property today and was listed on the National Register of Historic Places in 1994. The estate includes a 100-acre lake, a mill and a number of farm buildings that illustrate farming practices before the 20th century. A millpond and its wetlands sit at the heart of the park. North Carolina has many milliponds that were built by damming rivers and creeks for grist and saw mills. This habitat is home to frogs, fish, turtles, and snakes. The park also includes a number of diverse forest and open land habitats -- longleaf pine, mixed pine and hardwood forests and native grass meadows. The red-cockaded woodpecker, an endangered species, can be found in the park. Carvers Creek State Park. N.C. Division of Parks and Recreation. http://www.ncparks.gov/Visit/parks/cacr/main.php. "Carvers Creek State Park Opens to the Public." Annual Report of the North Carolina Division of Parks and Recreation. 2013. http://digital.ncdcr.gov/cdm/ref/collection/p249901coll22/id/172123 (accessed August 18, 2015). "The Legacy of James Stillman Rockefeller at Carvers Creek State Park." North Carolina State Parks. http://www.ncparks.gov/Visit/parks/cacr/pics/rockefeller.pdf (accessed August 18, 2015). National Park Service, National Register of Historic Places. [Long Valley Farm] Registration Form. 1993. http://www.hpo.ncdcr.gov/nr/CD0200.pdf (accessed September 1, 2015).